The Afghan National Civil Order Police or ANCOP is a special police unit of the Afghan National Police (ANP) and falls under the Ministry of Interior or MoI. 3. The reorganization will see the majority of the 13,000 ANCOP personnel transfer to the MoD while roughly 2,550 will remain with the MoI to serve as a quick response unit and as a reserve to regular police units during periods of civil disorder. The narrative provided below is based on historical reporting about ANCOP. On March 18, 2018, ANCOP was moved from the Ministry of Interior (MoI) to the Ministry of Defense (MoD). Mission. The ANCOP's mission is to provide crisis response in urban areas, prevent violent public incidents, and provide civil order presence patrols. In addition, it will perform specialized high-risk missions in support of the Afghan Uniform Police (AUP) and other ANP units and elements. Misuse of ANCOP. Unfortunately, at the urging of U.S. military leaders, the ANCOPs role has been changed in some provinces to that of manning checkpoints along major lines of communication (such as Highway 1); which is an almost complete misuse of a specialized and highly trained police unit. Checkpoint Mentality. Many battalion and brigade commanders of the U.S. Army forced the ANCOP to be deployed along major routes to set up stationary checkpoints. This, of course, does nothing to win the COIN fight and was (is) a horrible missuse of what were highly-trained, educationed, and motivated police special units. But then, most U.S. conventional commanders didn't really understand the ANCOP mission and their were no attached advisors to help them see the light. History of ANCOP. The Afghan National Civil Order Police was established in mid-2006. Early trainers of ANCOP included French gendarmes as well as other European police officers. Recruitment of ANCOP Police. Members of the ANCOP must have a base-line literacy ability to gain entrance into the ANCOP ranks. However, the fact is that many enter ANCOP training without knowing how to read. 1. In addition, many ANCOP recruits are not physically fit for harsh duty assignments. Therefore the quality of the ANCOP policeman is less than desired. Training. The members of the ANCOP undergo an 16-week training program. There are regional training centers located around the country to include ones at Mes-a-Sharif, Herat (Adreskan), and the National Police Training Center (NPTC) in Wardak province. Personnel Strength. By December 2010 the ANCOP had grown to a 9,000 man force. High Optempo and High Attrition Rate. The ANCOP, being a specialized and highly trained police unit, was over utilized in its initial years (2006 to 2010). This resulted in a very high attrition rate among the personnel - as much as 80% on average a year. In 2011 a renewed sense of mission revitalized the ANCOP kandaks. However, once the SOF advisors uncovered from the ANCOP kandaks they began to be used for the wrong types of missions once again. Problem Areas. The ANCOPs have a disrupted Operational Deployment Cycle (ODC) that interferes with the programmed leave and training cycles. The lack of a partnered force or advisor team renders the ANCOP to political wrangling by Afghan politicians and senior members of the MoI. As of mid-2014 the ANCOP kandaks suffer from low morale, inadequate training readiness state, less than ideal leadership, and a high attrition and desertion rate. Involvement of U.S. Special Operations Forces. Due to the overuse of ANCOP and its high attrition rate it was determined that U.S. SOF would partner with selected ANCOP units - specifically in the very intense fighting areas of Kandahar. Those units that Special Forces did partner with benefited greatly - their operational performance improved and their attrition rate diminished dramatically. 2. Special Forces units trained up to eight ANCOP kandaks and partnered with at least four ANCOP kandaks. Afghan National Civil Order Police or ANCOP. By Wikipedia. Provides info on organization, references, and external links about the ANCOP. Perito, Robert M., Afghanistan's Civil Order Police: Victim of Its Own Success, Special Report of the United States Institute of Peace. This report describes the efforts of the NATO-led coalition forces in Afghanistan to create a constabulary force to control urban violence and serve as a counterinsurgency force. ANCOP was a victim of its own success as its mission changed, it spent considerable time in dangerous combat zones, and high attrition rates nearly ended the force. 1. See Establishing a Police Force for Afghanistan by the Institute for the Study of War. Accessed here on the ISW website on December 29, 2011. April 13, 2010. "ANCOP under strain". The Long War Journal. Video about the enormous pressure ANCOP policemen are under as they fight on the frontlines against the Taliban. March 3, 2015. "Advisors focus on ANCOP readiness, sustainment". DVIDS. A Police Advisory Team (PAT) from TAAC-East visits ANCOP headquarters to discuss current operations and sustainment for future operations. June 25, 2013. "Marine advisors take an over-the-shoulder approach to training the Afghan police". Marines.mil. Garmser district ANCOP, 2nd Kandak, 7th ANCOP Brigade, are trained and advised by Marines of ANCOP Advisor Team 2. June 17, 2013. "ANCOP command sergeant major wants to grow senior enlisted leadership in ANSF". NTM-A. February 28, 2013. "After successful operation, ANCOP stays ahead of insurgents". The Camp Lejeune Globe. July 3, 2012. "Afghanistan killings: Suspect's name released". BBC News. An ANCOP member kills three British military members in an insider attack. May 30, 2012. "ANCOP commander visits Tagab Forward Operating Base". Regional Command East. A shura is held to coordinate activities of ALP and ANCOP. April 17, 2012. "AF officers advise Afghan police". CENTAF.af.mil. A four-man advisor team mentors an ANCOP kandak in Kajaki, Afghanistan. April 12, 1012. "Afghanistan: reasons to be cheerful (opinion)". Security Clearance Blog, CNN. A counterinsurgency advisor offers hope after observing ANCOP units. June 2, 2011. "For police trainers in Afghanistan, making recruits competent is an uphill struggle". Stars and Stripes. As part of ANCOP training recruits must first learn to read and write; which is a detriment to students learning other police skills. Story about training ANCOP at the Adraskan National Training Center in Herat province. May 18, 2011. "New details in Afghan police center killings". Marine Corps Times. Two Marines are killed by ANCOP member in Lashkar Gah, Helmand province. April 1, 2011. "Afghan National Civil Order Police officers practice intelligence gathering, relationship building". DVIDS. A four-man Mobile Training Team (MTT) consisting of a Afghan driver, US instructor, Afghan instructor, and interpreter travel from ANCOP kandak to ANCOP kandak to conduct intelligence gathering classes. January 27, 2011. "MPs train Afghan police force". Fort Hood Sentinel. ANCOP receive driving lessons in Kunduz, Afghanistan from 137th MP Detachment. December 15, 2010. "Afghan National Civil Order Police provides an example of 'what right looks like'". Army.mil. General Petraeus visits ANCOP leaders in Kabul. July 9, 2010. "ANCOP and Afghanistan's Police Problem". Aviation Week. Article by Paul McLeary discusses the lack of proper training of ANCOP and other police units. April 9, 2010. "General Provides Update on Afghan Police Training". American Forces Press Service. MG Mike Ward provides an update on ANCOP training, ANP corruption, partnering efforts, and lack of police trainers. April 8, 2008. 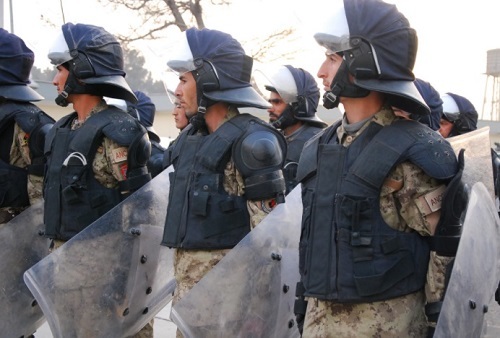 "Afghanistan Opens New Civil Order Police Training Center". American Forces Press Service. The Adreskan training center for the ANCOP opens in Herat. 1. For more on non-literate recruits joining ANCOP see "For police trainers in Afghanistan, making recruits competent is an uphill struggle". June 2, 2011, Stars and Stripes. 2. For more on SOF partnering and training of ANCOP kandaks see "Special Forces training Afghan police units", Army Times, June 11, 2010. 3. For the move from MoI to MoD see "Ministry of Defense takes command of police unit", Resolute Support Headquarters, March 27, 2018. All external sites open up in an new window. Please report any broken links, corrections, or inaccuracies to the webmaster at staff@afghanwarnews.info.